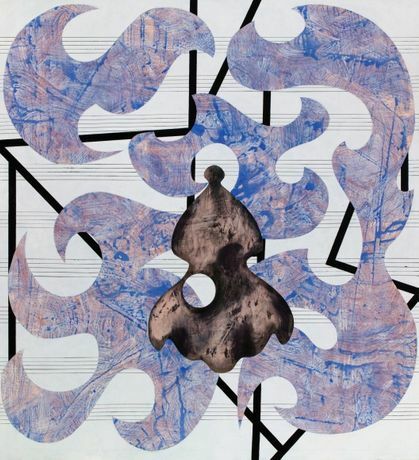 Charline von Heyl: Lady Moth, 2017. Petzel Gallery is delighted to announce an exhibition of new paintings by Charline von Heyl. Over the past three decades, von Heyl has made paintings that upend conventional assumptions about composition, beauty, narrative, design, and artistic subjectivity. The new paintings in this, von Heyl’s ninth solo show at Petzel, are composed inventions that function as self-perpetuating visual events; enigmatic presences silently seducing and disturbing the viewer. Von Heyl’s new paintings shake loose work against language and capture time through dense compositions replete with moody rhythms of color and shape. A number of her effects can unexpectedly dazzle a viewer’s perceptions. The repositioning of one’s body opposite a painting reveals in cross-raked light interference colors that shift in value from pink to green and from yellow to violet. In some cases, paint may bleed through the linen’s verso; in others, shapes are imprisoned under a layer of color as ghost images. Some works, devoid of color, are able to re-energize through stark black graphics. A painting can often begin with a meandering line that loops and snaps into a biomorphic checkerboard. Various images, such as moths, rabbits, heads, and faces have been deceivingly painted as if placed on the surface as a second thought. These sequences unfold slowly while the painting is viewed—overlapping, dissolving, or blending to produce an image that stands for itself as fact. Charline von Heyl was born in 1960 in Germany; she lives and works in New York and Marfa, Texas. Her work has been exhibited both in the United States and abroad, including solo exhibitions at The Tate, Liverpool; Kunsthalle Nürnberg, Nürnberg; Bonner Kunstverein, Bonn; ICA Philadelphia; ICA Boston; Le Consortium, Dijon; The Dallas Museum of Art, and in the Vienna Secession. Von Heyl’s works are in the collections of The Tate, London; The Museum of Modern Art, New York; The Museum of Contemporary Art, Chicago; Musée d’Art Moderne de la Ville de Paris; The Museum of Contemporary Art, Los Angeles; and The San Francisco Museum of Modern Art; among many others. The New York exhibition will take place concurrent to her large solo survey show Snake Eyes at the Deichtorhallen, Hamburg, which will travel to the Museum Dhont-Dhaenens, Sint-Martens-Latem, Deurle, and the Hirshhorn Museum and Sculpture Garden, Washington D.C., later this fall. Her newest catalog, Snake Eyes, will be available at the Petzel Publications bookstore.